Please use the Subscribe form on this page if you would like to receive our newsletter and join us as a Prayer Partner. Clarence Jones never imagined that his dream to share the gospel message would take him from his basement apartment in downtown Chicago to the Ecuadorian Andes and later, take the ministry to the arid scrublands of outback north Western Australia. It all started on Christmas Day 1931, Radio Station HCJB began broadcasting in Quito, Ecuador. Since that time, Reach Beyond has grown into a global media and healthcare ministry, partnering with local believers to reach the unreached. 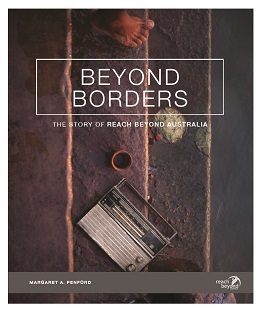 In Beyond Borders, Margaret A. Penford tells the inspirational story of Reach Beyond Australia, a shortwave radio ministry which today broadcasts the gospel message in over 30 languages to the Asia Pacific region. She describes the beginnings of the Australian office, the Aussies who have served the mission and God’s miraculous provision of the Kununurra shortwave broadcasting site. The purpose of this book is not to give a detailed history, but rather to show how God was at work in circumstances, people’s lives, even the decisions of government and governing bodies to bring about His purposes. It’s aim is to bring honour to Him by showing His faithfulness against great odds, His provision, often miraculous, and His workings in and through His people. This book can’t possibly contain every element of the story of Reach Beyond in Australia over the last sixty years (so many people have contributed) but we have tried to include scenes that will build an accurate picture for the reader. It’s purpose is to remember the great story that God initiated through His people, a story that continues today. Supporters of Reach Beyond are a vital and powerful part of that story. In the pages of this well-presented coffee table book, you will read that through faith, God is able to do more than we could ever hope, think, ask or imagine. We are excited to be able to give you a taste of this story with the release of several chapters. We hope that this book will encourage you in your pursuit of God and the journey He has chosen for you, like He has done for us. Cost per book is $30.00 or $50.00 for two books, (incl. GST) plus postage.